Gotta Play Tennis: The BRIT, the BRIT, the BRIT IS ON FIRE! The BRIT, the BRIT, the BRIT IS ON FIRE! What is going on with Andy Murray lately? Does he finally believe he can go all the way and take titles? It seems that Murray has been the bridesmaid so many times and not the bride. I almost began to feel embarrassed hearing his opponents sing his praises and then mention how some day he would definitely be taking home the trophy. Now don't think that you maintain number four in the world for three years in a row by losing all the time. It's just that he has been so close to taking the big prize over and over again to no avail. If we take a look at 2011, we find the following: he lost in the finals of the first Grand Slam of the season, the Australian Open, to Novak Djokovic. He then made it to the semifinals of the French Open where he lost to Rafael Nadal in straight sets. At Wimbledon, the third Grand Slam, he did very well but once again lost to Nadal, this time in four sets during their semifinal matchup. Last but not least, Murray made it to the semifinals of the U.S. Open where he once again faced Rafael Nadal. 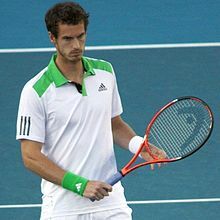 But in a repeat of the French, Andy lost in four sets. Then began the Asian swing and suddenly something changed. In traditional Chinese culture, qì (also chi or ch'i) is an active principle forming part of any living thing. It is a life force or energy flow generated and it is tied to breath or air flow from the body. Is it possible that Andy has somehow found his inner force or vital energy that has turned on the winner switch? In the last few weeks, he first won the Thailand Open over Donald Young in straight sets. He then went on to take the title at the Rakuten Japan Open where he finally beat Rafael Nadal in three sets. Murray capped off his run as the defending champion at the Shanghai Masters with a difficult but nonetheless straight sets win over David Ferrer. Not only did he play some inspired tennis to achieve these successive wins, but in the rankings, he overtook Roger Federer and now holds the position of number three in the world. I think the Asian people would say that Andy Murray used his chi very well indeed. REFLECTIONS: What is a GOOD hitting session?